Harvesting Catnip and Rue seeds. This week the catnip and rue seeds have ripened and are at their peak for harvesting. These two plants need very different approaches in the harvesting process. When harvesting seeds, all plants, and hence the seed, needs to be very dry. If not the plants and seeds tend to retain moisture and may develop mold. So instead of being able to harvest first thing in the morning when the temperatures are cooler we have to wait for around mid day when the plants have totally dried off before we can start. This makes the job more unpleasant if you don’t like too much heat. Catnip (Nepeta cataria) is grown in full sun in large beds. Its not bursting with seed. Fortunately its not to difficult to harvest the plants, we do this with a scythe and lop the plants off. In most cases they will regrow a fresh crop of leaves for late fall harvest, often they will flower again. It also means that harvesting is fairly rapid with most of the seed separation done later in the seed processing shed. The other problem with heat is that the harvester tends to sweat more, and is wearing sunscreen a very important factor for working in the direct sun. The downside is that this tends to make the skin sticky. Add to that the person is working in hot sunny weather so they tend to sweat as well, making them even more sticky. Now place that sticky person in a field full of catnip plants bursting with seeds. The result tends to be a very interesting plant/person hybrid or someone that looks as if they have a very unpleasant disease. It also tends to mean that a lot of seed wasted in the shower drain. Sometimes it can take hours to remove all the seeds afterwards, and never ever put your hands in your hair while harvesting! Seeding rue Ruta graveolens plant. 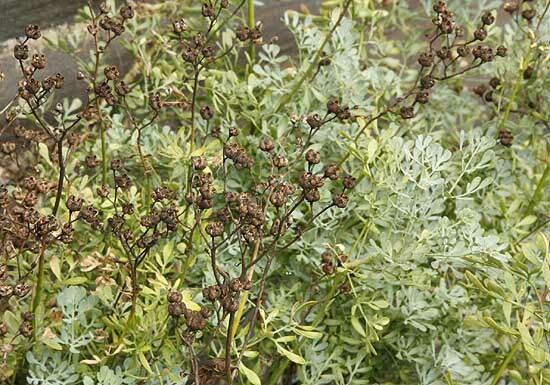 Rue (Ruta graveolens) is a different matter. 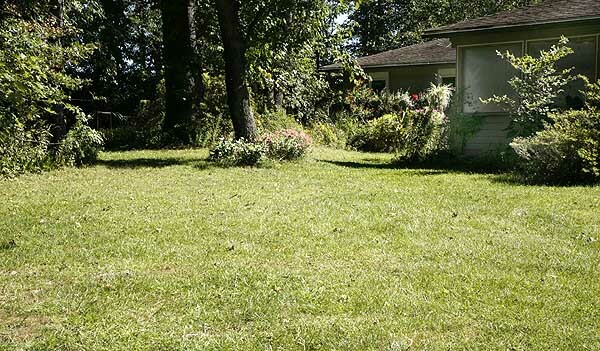 It’s a semi shrub like bush with seed heads that need to be cut off individual, while a scythe can be used it usually more effective to use snips. This means that the harvest takes a lot longer. 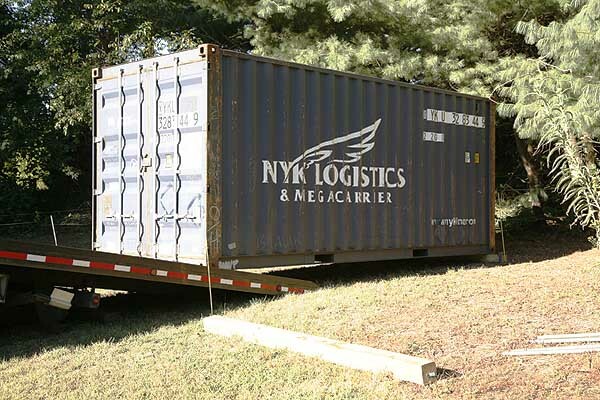 The later processing is faster because there is not as much extraneous material but the bulk of the work is done outside in the sunshine not in the shade of the shed. Additionally rue plants exude a sap which can be very irritating to some peoples skin and cause very unpleasant dermatitis or ‘rue rash’. Intolerance can also build up over time so just because someone was ‘immune’ last year does not mean that they will be this year. So to overcome this problem the harvester must have long sleeves, long pants and gloves. Not the most desirable attire in hot summer weather. We tend to draw lots each year as to who harvests the rue. Which takes much longer to harvest that then catnip due to the selective ‘pruning’. This year the short straw has fallen to me, so I am just waiting for the dew to evaporate off the rue bushes before I gear up and go harvest in the heat. This is one of the days when being a farmer is not quite so pleasant. Author Janice Hazeldine PhDPosted on August 29, 2016 September 3, 2016 Categories Farm work thru the yearTags catnip, harvesting, herb seeds, Nepeta cataria, plant seeds, rue, Ruta graveolens, seed, seed harvestLeave a comment on Harvesting Catnip and Rue seeds. 14 Reasons CALENDULA should be part of your summer garden. 1. It has wonderful bright rich golden flowers that bloom continuously throughout the summer. Ergo its really pretty. 2. 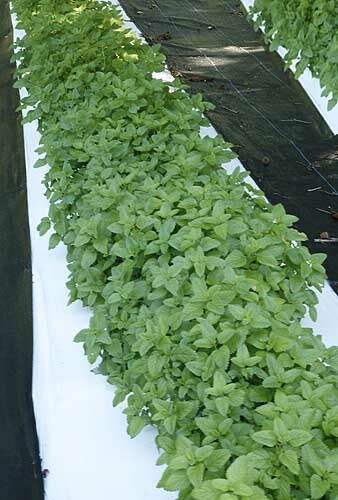 It grows fast from seed and will be flowering within 8 weeks from seed, sometimes faster. Just scatter the seeds and lightly cover them. It does need regular water, but a soaker hose wound through the bed and turned on for 30 minutes every day will have the whole area looking like a golden field very shortly. 3. It can be seeded continuously throughout the summer months if desired ensuring that there are always bright sunny flowers in the garden. 4. The butterflies bees and especially the native bees LOVE it. They can be seen busying visiting the flowers every day and it provides essential nectar and pollen at a time when most native plants have stopped producing. 5. It has wonderful scented leaves and flowers. They have a special tang of their own making them very attractive and delightful to smell. 6. While we like the smell of the flowers and leaves the deer and rabbits don’t so they leave the plant alone. Great for gardens that have wild animal problems. 7. 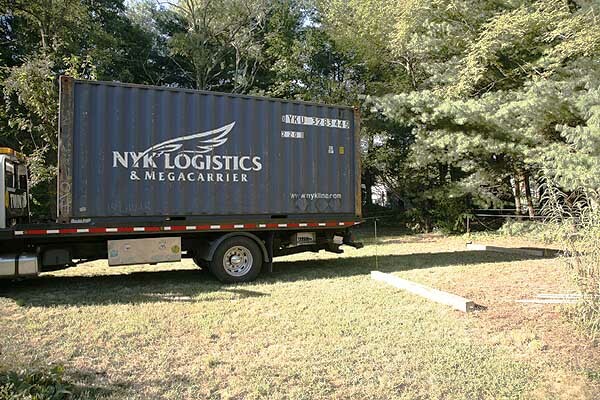 It likes full sun and tolerates the heat very well. Its great to look at out the window when its too hot to go outside, it helps bring the garden inside just by admiring it. 8. It can help repel aphids, snails, slugs and cabbage looper if planted close to susceptible plants. 9. Leaves are edible and very nutritious, rich in vitamins and minerals. Can be used in salads or used in stir fry, soups or other dishes. They have a interesting sweetness followed by a salty taste which is quite unique. Some people love it some hate it. Try if for yourself and find out. 10. Petals can be used in cooking as substitute for saffron. Used to color rice dishes as well as potatoes, soups and desserts. 11. Flowers are used as a herbal remedy for many different maladies most commonly its used in the form of a cream for skin conditions, wounds, sprains, bites stings and other skin problems. 12. Makes a wonderful cut flower, lasts well and provides an interesting scent and sunny cheerfulness in the house. 13. Needs very little care once established. Although dead heading will encourage plants to flower more and more. 14. 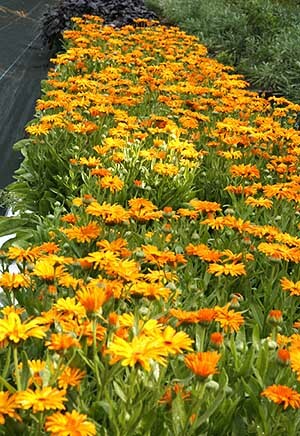 Its hard not to feel happier and smile when you look at a bed of calendula flowers! I love these plants, they are one of my favorites. I always grow our rows where they can be seen from the house so that we can all enjoy them even when its too hot to go outside. 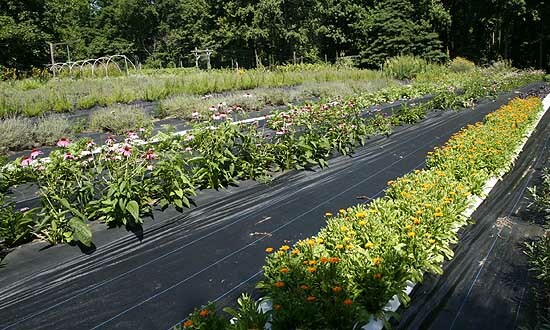 We harvest our flowers every two days during the summer months and every day there are more flowers coming along. 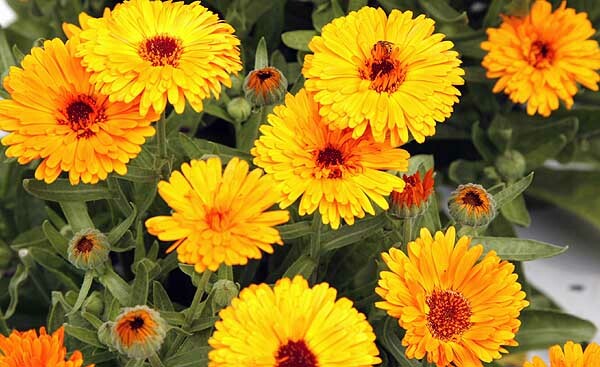 Often known by their common name of Pot marigold they are indeed a member of the marigold family. However I find these flowers much more charming. I don’t like the smell of marigolds while I know some people who do, they seem to be few and far between. Also marigolds tend to attract small insects, often thrips in large numbers. If you shake your marigold plant you can see little white dots flying out of it. Pot marigold does not have this problem. Additionally rabbits eat marigolds. 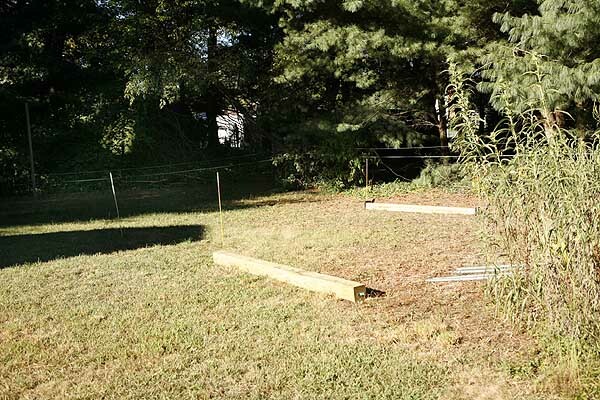 I was told long ago that they did not and to plant them around things I wanted to protect to keep the rabbits off. One morning I looked out my window to see a rabbit with a huge marigold bush in its mouth. It proceeded to eat the thing down to nothing. So much for that idea. 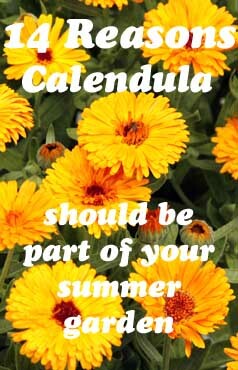 If you want to grow pot marigold (calendula) its not too late this year, or plan for next year. We offer seed here. Author Janice Hazeldine PhDPosted on August 15, 2016 Categories plantsTags best summer annual, calendula, golden flowers, happy flowers, pot marigold, reasons to grow calendula, summer annual1 Comment on 14 Reasons CALENDULA should be part of your summer garden. Beating The Heat On A Small Farm. This past two weeks we have had an ‘excessive heat warning’ and now even though the heat is reducing a little its still HOT out there. This makes life on a farm difficult to say the least. While some people seem to enjoy working outside when its hot I don’t and neither does anyone else on our farm. So we have to plan a strategy. In the late evening we take a walk through the fields to check everything out and see how the crops are doing. Any immediate problems are addressed. This usually means fixing an irrigation leak or removing an errant weed or two. We make a note of what crops are in need of harvesting. We get up with the sun, usually around 5am and get out in the fields by 5.30am to harvest the crops earmarked for that day. How much that is will depend on what the weather is going to be like for the rest of the week. If its going to be hot and we have a cooler day we will harvest everything we can fit in our fridge and process them during the week. Otherwise we harvest only what is essential to be harvested that day. We plan our harvesting by the suns location. All harvesting in our side field is done first as the sun will hit that first as it rises over the trees on the east side of the property. Then we follow the line of shade across the fields harvesting as we go to try and stay in the shade as much as possible. It does not always work, sometimes a crop takes longer to harvest or we just cant keep up with the sun line, but most times it works pretty well. Then we all scurry back to the house by 10am at the latest for a late breakfast. On really hot days we try for 9am unless we can work in the shade. Then we spend the rest of the day working on what we just harvested and getting as much into the dryers as possible, the rest goes in the refrigerator to be worked on the next day. 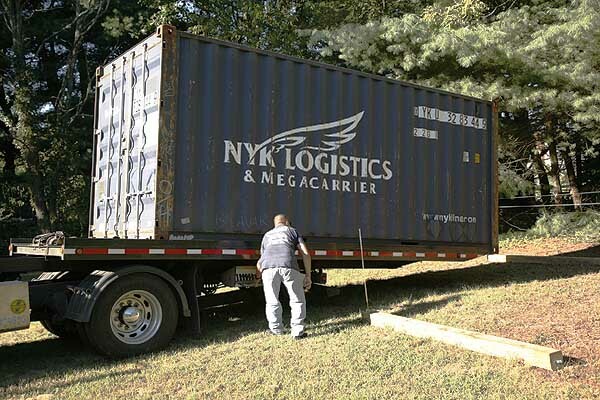 If we have time we also try to get some office work – and blog writing done too. Office work always comes last as it’s not as perishable as crops. While this means that often our blog does not come out every few days it does mean we have a really great crop harvested and dried at its peak. Keeping hydrated when working in the heat is always very important. We lug gallons of water down to the field and stop frequently to drink. This is extremely important for everyone who is working or even just being outside in the heat and sunshine. Staying safe and keeping cool is important. 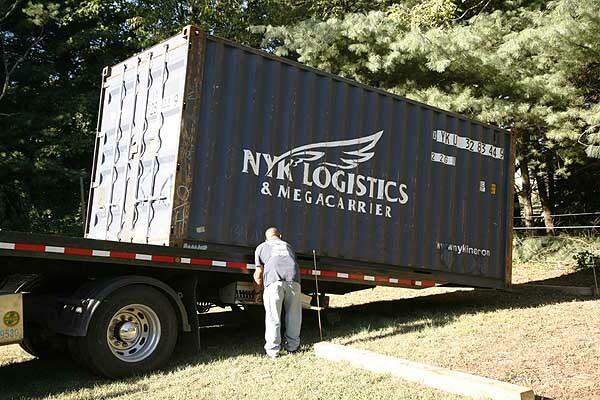 never stay or work outside if you can’t tolerate the heat. Author Janice Hazeldine PhDPosted on August 1, 2016 August 4, 2016 Categories Farm work thru the year1 Comment on Beating The Heat On A Small Farm. This July we have had a lot more days with temperatures in the very high 80’s and low 90’s with ‘real feel’ temperatures over 110 and excessive heat warnings on many occasions. While I know some people love this kind of weather and think its not summer without it I hate it. For one thing the gooseberries ripen too fast. Usually it takes a while for a gooseberry to turn from green to pink, then deep red, this year its been really rather fast. 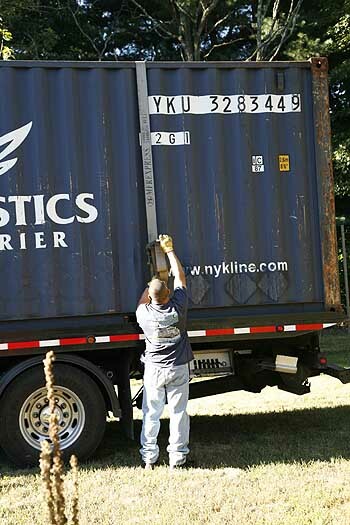 This means that our plans to ship out fresh gooseberries has to be shelved for this year. We like to send them out green to slightly pink. 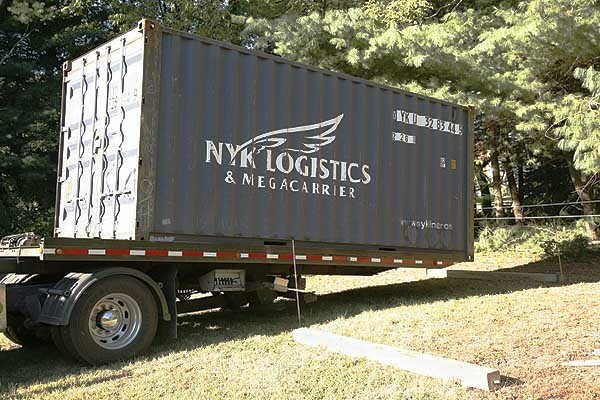 Even though they are sent with frozen packs and shipped overnight or at most second day post the weather is just too hot and the berries would not arrive in good condition. So we can only sell fresh to those close to us. 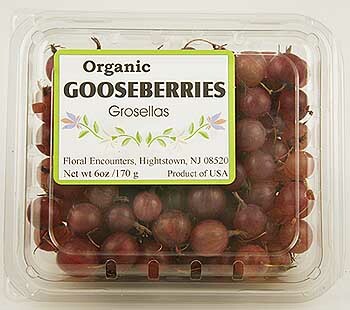 If anyone in central New Jersey, is interested in fresh gooseberries we have them. Our fresh ones are mostly red now but we have frozen berries in green, green/pink and red. If you are interested in purchasing please see our gooseberry page and contact us. Author Janice Hazeldine PhDPosted on July 24, 2016 Categories Farm work thru the yearLeave a comment on Gooseberries Are Ripening Fast! It’s an early morning activity. Pick a day when there is little dew on the ground, get the bin ready along with a long sleeved shirt and think leather gloves and its time to pick. Still its better to pick than many other fruits and its worth it. First off I get to be outside in the early morning listening to the sounds of nature. There is a family of blue jays cackling in the background and the little ones scream at their parents for food. The catbirds are squawking and they are all eating my raspberries which I did not get chance to net this spring. No matter I will get a fall crop. Its peaceful and even with the thorns I enjoy picking gooseberries. I am hooked on this tart little green to pink fruit. We will have fresh gooseberries for sale in a couple of days time. 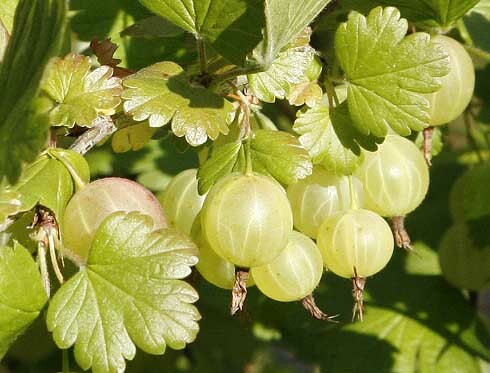 Don’t know much about gooseberries? We are declaring July as gooseberry month and will be offering fun facts and information about gooseberries all month long. Gooseberries ready to be picked. Author Janice Hazeldine PhDPosted on July 14, 2016 Categories Farm work thru the yearLeave a comment on It’s Gooseberry Picking Time. Harvesting is in full swing. At this time of the year its hectic on the farm. There is still planting going on and the harvesting is in full swing too. I like to harvest quite a few things at once then come in and work on processing them through the dryers over the next couple of days. This is especially important when its going to be hot and humid, or if its going to rain. Of course we cannot harvest on rainy days and I really don’t like being outside working when its really hot. If and excessive heat warning is predicted its time to get out, harvest and store in the refrigerator for a couple of days while its processed. So with that in mind I harvested solidly for two days. Day one was catnip day. We have a lot of catnip and it was beginning to flower nicely. That means its time to harvest for ‘flowering tops’ which is very popular with cat owners as the catnip has higher concentrations of nepetalactone the active compound that cats react to. 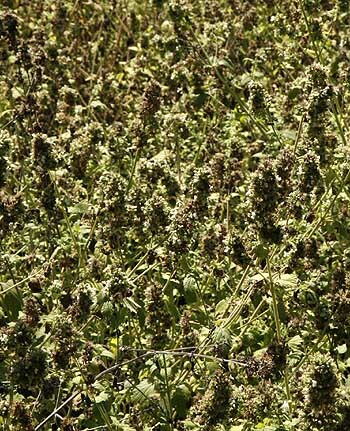 Catnip harvesting is always active, its not just cats that react to the smell, its more stimulating to humans and is often used in tea blends. Day two was more gentle. It was lemon balm harvest time. This is more calming plant and even during harvesting it’s has a more calming effect. Its also a little faster to harvest so I was able to get the lovage and the rest of the meadowsweet harvested at the same time. That filled up the fridge so for the next few days its washing and processing down for the dryers and time to stay out of the excessive heat. Author Janice Hazeldine PhDPosted on July 2, 2016 July 14, 2016 Categories Farm work thru the yearTags harvesting, harvesting herbsLeave a comment on Harvesting is in full swing. The lavender harvest is over. So why are there so many flowers left behind? When I told my visiting friend that I have finished harvesting the lavender she was amazed. “But there are so many flowers left out there” she gasped. Maybe I should be more ruthless in my harvesting but I just can’t do it. When I am working down a row of lavender and I see the bees and butterflies working the flowers I can’t just cut it all down and take it away. Even this year when there are much fewer insects and bees than there have been in previous years, I can’t take away their food source. I also don’t think its right for the plant. It’s put a lot of work into making those flowers in the hopes or reproducing, I don’t feel as if I should cut every bloom down. So each plant has some blossoms left on it. I can go back later when the seeds are ripe, cut them down then and extract the seeds. This way our plants get to reproduce, the insects get to enjoy the flowers and so do I. I just love to look out the window and appreciate the loveliness of all those lavender flowers, to watch the butterflies flit from flower to flower. Most years we have more butterflies in our field than any butterfly garden I have ever been to. This way everyone gets to enjoy the lavender. I may not get as large a crop as I could, but what is a few extra bunches of lavender over helping to feed the bees, butterflies and other pollinators. 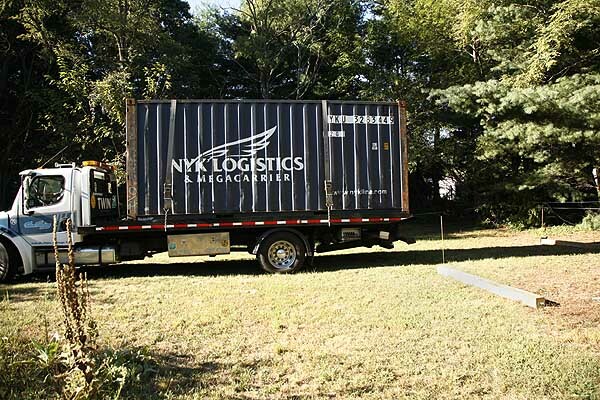 They will pay me back by pollinating my plants, making the fruit swell and producing great seeds! 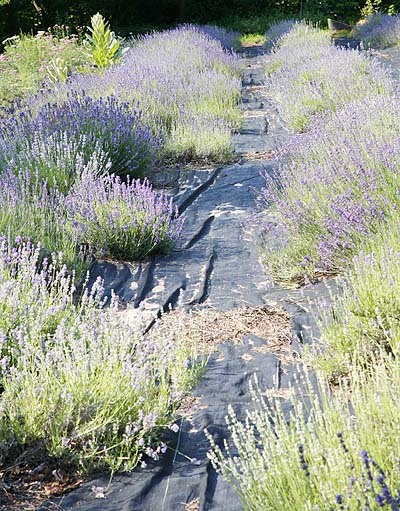 Author Janice Hazeldine PhDPosted on June 30, 2016 July 14, 2016 Categories Farm work thru the yearTags fresh lavender, lavender, lavender bunches, lavender farming, lavender harvestLeave a comment on The lavender harvest is over. 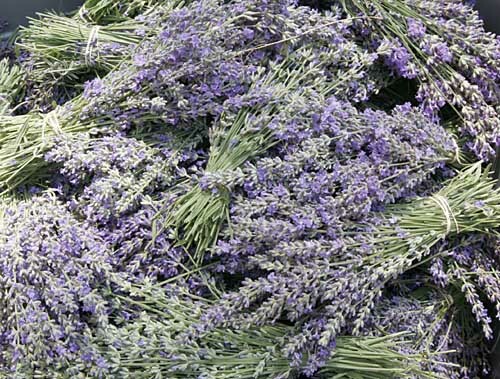 Today was lavender harvest day, well the beginning of lavender harvest anyway. The weather forecast says hot today so I started early 6.15am. Its really pleasant out in the field at this time of the morning, just me and nature, the birds tweeting and a few passing cars in the distance. After an hour the sun comes up over the trees on the western side of the property and the warn golden light washes across the field. Now it’s a race to get as much done before I fry. I tend to keep my head down concentrating on harvesting. I use a sickle to cut lavender and if you don’t concentrate on what you are doing you can have a nasty accident with one of these things. I stop to watch a bunch of turkeys go by a few rows over, they are used to me working out here now and are quite happy to co habit with me. Then I look up and down the rest of the row I am working on. 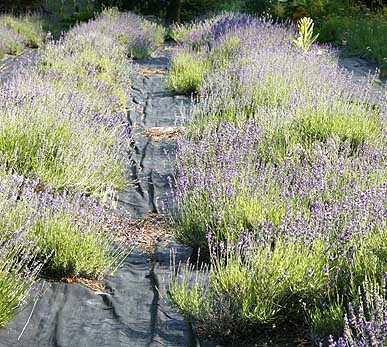 (my rows are 190 feet long, which is a LOT of lavender). That’s when I realize there is a problem. My lavender is not moving. That may sound like a strange comment about a plant, they are, after all planted, its not as if they jump up and run around. 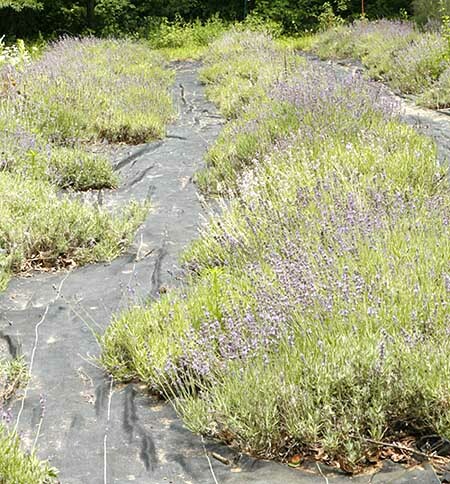 However lavender flowers are on thin, stiff stalks. They are stiff enough to keep the flower upright in almost any weather but they are not stiff enough to stand upright when a bumble bee lands on it. Every year when the lavender flowers the plants are in constant motion the flowers waving around as the bees move from flower to flowers. Its like a dance to music that I am not privy too. It’s a lovely site to see. This year there is no movement, there are no bees. When I look more closely I realize that there are not many insects at all. The bumble bees are usually the major visitor to the lavender flowers but there are usually others as well, the small native bees, the sand or ‘digger’ bees that build solitary nests in the sand and stock them with pollen, other pollen loving insects and a horde or butterflies. This year my flowers are alone. Finally I see ONE bee working alone, nothing else. I get up and go inspect the yarrow row. Yarrow has flat umbel flowers that are visited by other insects, not bees but other beneficials. We are a cosmopolitan farm and there is food for everyone in the insect family here. There are very few insects on the yarrow either. Something had wiped out all the insects. Its 10am on a hot sunny morning, the field should be humming, but its not. Its been a few years since I saw a honey bee in our fields. Our last hive was killed off by a spraying three years ago, but I was comforted in the masses of bumble bees we had. When we moved into the farm there were only a few, but over the past 9 years their numbers has exploded and we usually have hundreds if not thousands of them all over our fields. Our farm has something in flower from very early spring until the frost kills off the last plants it’s a nirvana for pollen lovers. Sadly they don’t just stay on our farm. Insects range, most likely to our neighboring farm. He sprays his fields (soy beans every year). I can’t prove that its his spraying that is killing the insects its only a theory. He did spray the day before my last hive died but I can’t prove it that was the cause. Without insects we will all die. Without pollinators there will be almost no food. Pollinators make the fruits on the vegetables grow and produce the seeds for next years crop. Without seeds all the plants will die and we will die too. The insect eating animals and the birds will die. The planet will die. I have long been a big supporter of stopping insect killing pesticides but this is the first time that I have seen the disaster in action. Without bees and other pollinators there will be no farmers and no food. Help save our planet, our food and us add your name to stop the sale of bee killing pesticides. Click Here. Author Janice Hazeldine PhDPosted on June 20, 2016 June 22, 2016 Categories happeningsTags no bees, no bees no food, save the beesLeave a comment on THERE ARE NO BEES!!! !